Tritonic Jam Session was specificallly made for the Melbourne Prize for Urban Sculpture 2008, Federation Square, Melbourne. Tritonic Jam Session is one of an ongoing series that utilises contemporary industrial plastic detritus to explore fundamental principles of modernism such as form, colour and spatiality. These plastics are especially tactile and often lurid in colour – characteristics that, not surprisingly, evoke an irresistible sense of play. Also evident are references to some of the more serious issues facing us today. For instance, the main component of Tritonic Jam Session is a grouping of twelve white ‘Triton’ water barriers. These barriers are a common sight throughout urban Australia, being literally lined up like snakes throughout cities and into suburbs. Their presence indicates a city in a state of flux, disrupted by building and road works, demolition and restructuring. 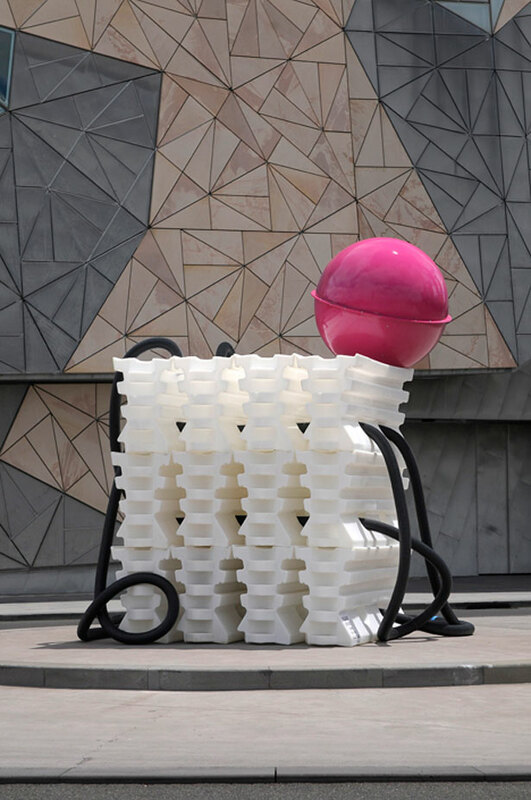 Tritonic Jam Session extends themes presented in recent works such as Industrial Jam Session (2007) and Monumental Jam Session (2008), both of which were exhibited in the Helen Lempriere National Sculpture Prize Exhibition, Werribee, Victoria.